So maybe I won’t go away altogether. And so I settle into my surreal life. Andy’s moved into an apartment just 5 minutes away from Jonah, and I’ve moved back into the house we lived in before we separated. Jonah’s old room is silent; Elmo’s gone to bed. I take a scrub sponge and find the spots of sauce and ketchup left from food thrown by Boo, up high and unnoticed before. I get the mop and wash the floor. I spray Windex and wipe the windows. Until recently, this house existed in such a state of ‘Jonah aftermath’ that cleaning was futile; a new spill or mess immediately followed the swipe of a paper towel, as if part of the process. The throwing-of-his-dinners undid any manner of order in the kitchen. In one enraged moment Jonah could cause at least an hour of clean-up . Needless to say, this place still has ceiling spots and wall splats. Behind the radiator in his room is an unreachable collection of magnetic letters and colored straws. I don’t even want to know what’s under the fridge. Nowadays when I clean, I figure whatever I am cleaning will stay that way, barring accident or natural disaster. But sometimes cleaning feels like I’m erasing my boy, and I find myself wanting to leave the stains and spots alone. When I was doing yard work yesterday I found a tiny shard of jagged glass. I knew immediately it was from last summer, when Jonah had that first terrible tantrum and kicked his bare leg through the double-paned window. Then for some reason I wanted it, that piece of glass. I can’t explain why. I took it inside and placed it almost reverently in a jewelry box on my dresser. 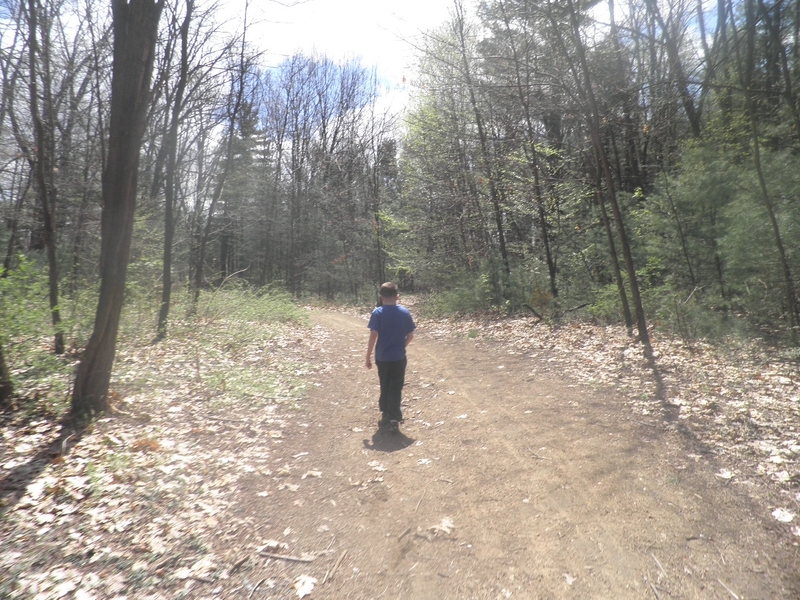 Sometimes I want to be Jonah’s mother – his caregiver – again, so much, I hate this new state of “geographical childlessness.” I don’t have another kid on which to focus mother-love. In a lot of ways, of course, life in the house is blessedly calmer. Now I can actually light a candle if I want; it can even sit for hours on a table. I can cook – chopping, mixing, baking, and sitting down, taking my time to eat. I can take 3 hour naps on Sunday. I can brew coffee and leave the machine alone instead of carefully unplugging the whole works and placing it on top of the fridge, out of Jonah’s reach. I can take down all the things that we’d moved higher and higher as he got older, taller, and more destructive. And when I go to the mall, I can ride the escalator once up and one down, instead of fifty or sixty times each way. Sometimes, though, something shifts inside my head – and as in a nightmare, I’ve left my son somewhere but can’t remember where and can’t find him, no matter where I look or for how long. He’s just gone. I didn’t anticipate the change this would have on my life, beyond the awareness that I’d miss him a lot. I didn’t think about the fact that I wouldn’t even have parenting in common with other parents anymore. And yet I am still his mommy, far away and sending love with all my heart to him across the distance. I know I’ll always be his mother, even when I can’t be with him, and I visit him as much as possible, but something is always whispering to me, asking questions I can’t answer. Is he truly happy there? Can he blossom? When I visit Jonah, I hug him tight, inhale him deeply…soak him in. I cry when it’s time to go, and at first I felt nauseatingly guilty leaving him behind. I still cry, and it still hurts, but I repeat my mantra: we’ve done the right thing. Now we get to see what’s possible. i cannot imagine what this must feel like for you. A sense of relief and a sense of emptiness? I hope that you keep writing. i just recently found your blog and have been reading archives as often as I can. Oh and I love your Spiderman son! Nothing I can say hasn’t already been said to you by others dozens of times. Just know that we all love reading your blog and seeing a glimpse of your life. 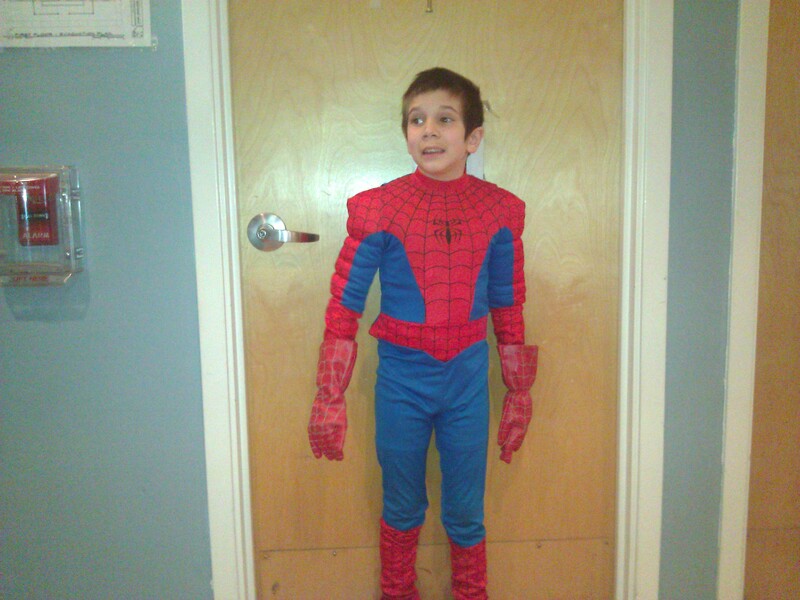 It’s great that Jonah dressed up as Spiderman and enjoyed Halloween. You are a great mother, because you’ve made the ultimate sacrifice so that he can see what’s possible and how far in life he can really go. Don’t let go of your writing as it is such a great outlet for you to pour out your emotions in a healthy way and get support from others. You’ve done the right thing, Amy! What is possible? Well, for starters your son was in a Spiderman costume this Halloween. Pretty “normal”, huh? I have struggled with the “am I still a Mom” thing for ten years. I am embarrassed to tell people it has been longer than that since I have seen my son. But, yes, I am a mom…I have the belly flab to prove it. I regale people with stories that happened 20 years ago. It’s how I feel normal. I love you, Amy. You are my hero and my friend whom I will probably never see again, but for whom I will always wish the best of life. The candle sits on the table for hours, Martie, not me! Silly mama. I love you too and miss you much!!! Thank you so much for sharing. I loved seeing him in his costume. My heart broke for you when I read about you cleaning up his previous stains. I am sure that is hard to do. But you aren’t erasing him, just the food stains. And you will always be his mom. I agree you made the ultimate sacrifice for your son. You are very strong for doing that to help him make progress. (big hugs). Please don’t go away. “Normal” is still only just a dryer setting, you still have a story to tell and this place is so you, you’ve made it your own. It can evolve, you can even change the tagline! But you’re still you, and all of us love coming here.